My biggest pet peeve with cookbooks is when they throw around undefined terminology, leave too much to the imagination and have no photos accompanying recipes. If you’re relatively new to baking and a recipe advises you to beat egg whites until they’re “stiff white peaks,” you may find yourself wondering what in the world this means. First separate the egg whites from the yolks. Let the whites get to about room temperature, or at least not quite as cold. For best results, you will need the assistance of an electric mixer or stand mixer – your arms likely don’t have the stamina! 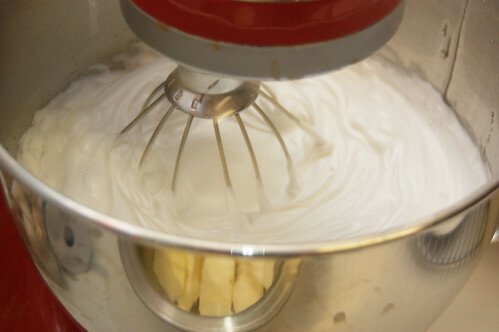 With your electric or stand mixer, beat the egg whites on high speed with a whisk attachment for several minutes. Do not rush the process. You’ll know you have “stiff white peaks” when the egg whites resemble marshmallow fluff. Your egg whites should also triple in volume. Follow your recipe instructions when adding other ingredients such as sugar. Patience and beating at high speed is key!